Tasmania is an island state, part of the Commonwealth of Australia, located 240 kilometres (150 mi) to the south of the Australian mainland, separated by Bass Strait. The state includes the island of Tasmania, the 26th largest island in the world, and the surrounding 334 islands. The state has a population of 507,626 (as of June 2010), almost half of which resides in the Greater Hobart precinct, which forms the metropolitan area of the state capital and largest city Hobart. Tasmania's area is 68,401 square kilometres (26,410 sq mi), of which the main island covers 64,519 square kilometres (24,911 sq mi). Tasmania is promoted as a natural state; almost 45% of Tasmania lies in reserves,national parks and World Heritage Sites and the state was the founding place of the first environmental party in the world. The modern state was founded as Van Diemen's Land by the British Empire, though it was inhabited by Tasmanian Aborigines for up to 40,000 years before. In 1856 it become a self-governing colony and renamed to Tasmania, and in 1901 it became part of the Federation of Australia. The northernmost terrestrial point of the state of Tasmania is Boundary Islet, a nature reserve in Bass Strait which, due to a quirk of history, is shared with the state of Victoria. Thesubantarctic Macquarie Island and its surrounding islands are also under the administration of Tasmania as a nature reserve and part of the Huon Valley Council local government area. The Bishop and Clerk Islets, about 37 km south of Macquarie Island, are the southernmost terrestrial point of the state of Tasmania, and the southernmost internationally recognised land in Australia. The state is named after Dutch explorer Abel Tasman, who made the first reported European sighting of the island on 24 November 1642. Tasman named the island "Anthony van Diemen's Land" after his sponsor Anthony van Diemen, the Governor of the Dutch East Indies. The name was later shortened toVan Diemen's Land by the British. It was officially renamed Tasmania in honour of its first European discoverer on 1 January 1856. Tasmania was sometimes referred to as "Dervon", as mentioned in the Jerilderie Letter written by the notorious Australian bushranger Ned Kelly in 1879. The colloquial expression for the state is "Tassie". Tasmania is also colloquially shortened to "Tas", especially when used in business names and website addresses. TAS is also the Australia Post abbreviation for the state. The name for Tasmania in Palawa kani is "Lutriwita". The island was adjoined to the mainland of Australia until the end of the last glacial period about 10,000 years ago. Much of the island is composed of Jurassic doleriteintrusions (upwellings of magma) through other rock types, sometimes forming large columnar joints. Tasmania has the world's largest areas of dolerite, with many distinctive mountains and cliffs formed from this rock type. The central plateau and the southeast portions of the island are mostly dolerite.Mount Wellington above Hobart is a good example, showing distinct columns known as the Organ Pipes. In the southern midlands as far south as Hobart, the dolerite is underlaid by sandstone and similar sedimentary stones. In the southwest,Precambrian quartzites were formed from very ancient sea sediments and form strikingly sharp ridges and ranges, such as Federation Peak or Frenchmans Cap. In the northeast and east, continental granites can be seen, such as at Freycinet, similar to coastal granites on mainland Australia. In the northwest and west, mineral-rich volcanic rock can be seen at Mount Read near Rosebery, or at Mount Lyell nearQueenstown. Also present in the south and northwest is limestone with magnificent caves. The quartzite and dolerite areas in the higher mountains show evidence ofglaciation, and much of Australia's glaciated landscape is found on the Central Plateau and the Southwest. Cradle Mountain, another dolerite peak, for example, was a nunatak. The combination of these different rock types offers incredible scenery, much of it distinct from any other region of the world. In the far southwest corner of the state, the geology is almost completely quartzite, which gives the mountains the false impression of having snow-capped peaks year round. Tasmania was first inhabited by the Tasmanian Aborigines. Evidence indicates their presence in the region, later to become an island, at least 35,000 years ago. Rising sea levels cut Tasmania off from mainland Australia about 10,000 years ago. By the time of European contact, the Aboriginal people in Tasmania had nine major ethnic groups. At the time of the British occupation and colonisation in 1803 the indigenous population was estimated at between 5,000 and 10,000 people. Through the introduction of infectious diseases to which they had no immunity, war,persecution and intermarriage, the population dwindled to 300 by 1833. Almost all of the indigenous population was relocated to Flinders Island by George Augustus Robinson. A woman named Truganini (1812–1876) is generally recognised as the last full-blooded Tasmanian Aborigine. Strong evidence suggests that the last survivor was another woman, Fanny Cochrane Smith, who was born at Wybalena and died in 1905. Ferns in Hellyer Gorge, to the northeast of Savage River National Park. Geographically and genetically isolated, Tasmania is known for its unique flora and fauna. Tasmania has extremely diversevegetation, from the heavily grazed grassland of the dry Midlands to the tall evergreen eucalypt forest, alpine heathlands and large areas of cool temperate rainforests and moorlands in the rest of the state. 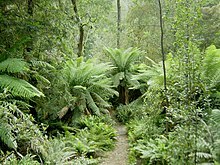 Many flora species are unique to Tasmania, and some are related to species in South America and New Zealand through ancestors which grew on the super continent of Gondwana, 50 million years ago. The island of Tasmania was home to the Thylacine, a marsupial which resembled a wild dog. Known colloquially as the Tasmanian Tiger for the distinctive striping across its back, it became extinct in mainland Australia much earlier because of competition by the dingo, introduced in prehistoric times. Owing to persecution by farmers, government-funded bounty hunters and, in the final years, collectors for overseas museums, it appears to have been exterminated in Tasmania. TheTasmanian devil became the largest carnivorous marsupial in the world following the extinction of the thylacine in 1936, and is now found in the wild only in Tasmania. Old chocolate vending machine at the Cadbury factory in Tasmania. Salamanca Market in Hobart, Tasmania.